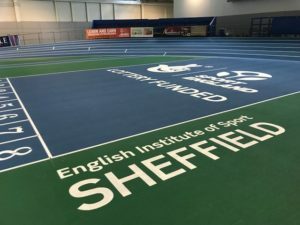 The country’s largest multi-sport training centre – the English Institute of Sport in Sheffield – has opened their new indoor athletics track to much excitement. This is yet another prestigious project that highlights DYNAMIK’s expertise in this area of sports flooring. The English Institute of Sport is used by International Athletes and community groups, schools, individuals and clubs. 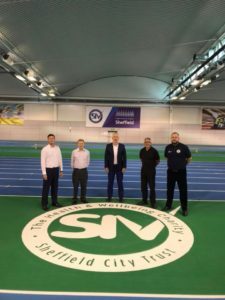 The new indoor track will be offered to pre-school age children to try out different sports up to adult athletics lessons making it a true multi-sport arena. As well as the 200m Indoor Athletics Arena, the English Institute of Sport houses two multi-purpose sports halls, a table tennis hall, a netball hall and a basketball hall. DYNAMIK work with clients from schools, universities and large arenas as well as contractors, architects and supply chain experts such as MONDO, Sports Labs Ltd & Replay Maintenance with equal expertise and commitment. DYNAMIK provide free of charge quotations and surveys which are carried out if you are looking to upgrade or maintain your sports facility. Contact us for more information on how DYNAMIK can help you.